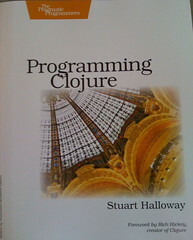 A few weeks ago I received my printed copy of Programming Clojure by Stuart Halloway in the mail. I had been a technical reviewer of the book so I was excited to see it finally in print. In case you haven't heard of it yet, Clojure is a programming language designed by Rich Hickey, a Lisp dialect, that runs on the Java Virtual Machine and is designed support concurrent programming. Clojure has excellent documentation and Rich has posted several great videos of talks he has given that cover the rational for Clojure as well as an introduction into the major concepts. I highly recommend that you watch those videos if you haven't already because Rich does a great job explaining why concurrency is hard using the typical Object-Oriented model that we program in today and how the features of Clojure support a better model for concurrency. Whether you are programming in Java, C#, Erlang, Haskell, Python, Ruby, etc., you will probably be able to learn something from these talks, and plus Rich is just an interesting guy to listen to. So after all that, you might be saying why do we need a book about Clojure? The answer is that although the documentation is good, it can be a little intimidating when first learning Clojure. For programmers with little or no Lisp or functional programming experience, figuring out how to do basic things the idiomatic way in Clojure can be a daunting task. Stuart's book does an excellent job filling this gap. The book covers all the major feature of Clojure and is very up-to-date. As a reviewer I got to see the evolution of this book from revision to revision and it was amazing to me to see how much work Stuart put in. Chapters were often completely re-written to keep up with changes in the language that occurred before it stabilized in a 1.0 release. I think the final product greatly benefited from that work and is an excellent resource for learning Clojure. I encourage you to pick up a copy today. Is Clojure An Acceptable Lisp? This is a problem. It's not a little teeny one, either. The Lisp communities (yeah, there are a bunch) are going to have to realize that if Lisp is ever going to be massively successful, it needs an overhaul. Or maybe a revolution. Contrary to what some might tell you, it doesn't need a committee, and it doesn't need a bunch of money. Linux proved exactly the opposite. Lisp needs a benevolent dictator. Lisp needs to ditch the name "Lisp", since it scares people. And Lisp needs to learn from the lessons of the 45 years of languages that have followed it. Sounds a lot like Clojure. Do you agree? Incidentally, this is one of the reasons I have been really interested in Clojure. It challenges the validity of object-oriented project in a very serious way. In Clojure, you don't define new classes, instead your program is simply comprised of functions that takes input, possibly call other functions, and return values. Studying functional languages helps you to see the benefits and weaknesses of object-oriented programming. Read more about this idea of studying programming in Glenn Vanderburg's article about Koans. Programs written in dynamically typed languages require large suites of tests to give some assurance that simple type errors cannot occur. Test suites cannot offer complete coverage: some common tasks, such as refactoring a program to make it more modular, can introduce new type errors that a test suite may not expose. In Haskell, the compiler proves the absence of type errors for us: a Haskell program that compiles will not suffer from type errors when it runs. Refactoring is usually a matter of moving code around, then recompiling and tidying up a few times until the compiler gives us the "all clear". One thing I learned when moving from Java to Ruby is that developers often rely on the compiler as a false sense of security. The notion that you can refactor a bunch of code, get it to the point where it compiles and then feel that your code works is dangerous. You code can still contain all sorts of runtime and logic errors, therefore if you want to have any degree of certainty that your code is free of bugs, you need to have some sort of test suite, regardless of if you are using a dynamic and statically typed language. I've also heard the argument made that statically-typed languages allow you to write less tests, but I have also not found this to be the case. Most syntax and type errors will be found with the same tests you use to test the logic of the program. In other words, you don't have to write one suite of tests to check for syntax errors, one for type checking and another for testing the logic of your program. So the moral of the story is that regardless of whether you are writing your code in a statically or dynamically typed language, you still have to TATFT.